My life seems to be in such a great place right now, I get the most exciting emails, things I didn't even dream tapping away on a keyboard could lead to, sometimes it's more like hammering but you get the idea, suffice to say life is good! Don't get me wrong, I am working a stupid amount of hours, remember I said I never schedule blog posts in advance, the earliest I'll ever write them is the night before, I just don't think I have a "what's going to happen in 3 weeks time"voice, I doubt I ever will if I don't have it after 10 years. Every day I find one hundred reasons to smile and I never go to bed stressed out anymore, even challenging days just serve to make the best days seem even better, I feel lucky, I feel successful and I feel like something marvellous is just around the corner. Now it may well be that you have arrived here today feeling gloomy or low and you just want a little light relief, well you've come to the right place, it's Thursday, it's summer (well sort of) and here's three things which are making me happy right now. 1. Happy yellow shoes, there are offers in life that I'll never turn down, cake, biscuits and shoes are on a special love list all of it's own. I got so excited about these that I even did a little Facebook live video to ubox them and lets just say they were very well received. These little wonders are so comfy and pretty, they're also a perfect fit, they're the first pair of peep toe shoes I've had for years, Adesso the lovely people who sent them have a website full of pretty shoes and not just pretty shoes but bright, happy colourful shoes, you can never ever have a bad day when you have happy feet, it's just not possible! I've always said my top tip for a happy life is wear fabulous shoes, if you've ever heard me on Radio Newcastle in the past when I've been into the studio you can count on the fact that even though you can't see me I am wearing beautiful shoes. 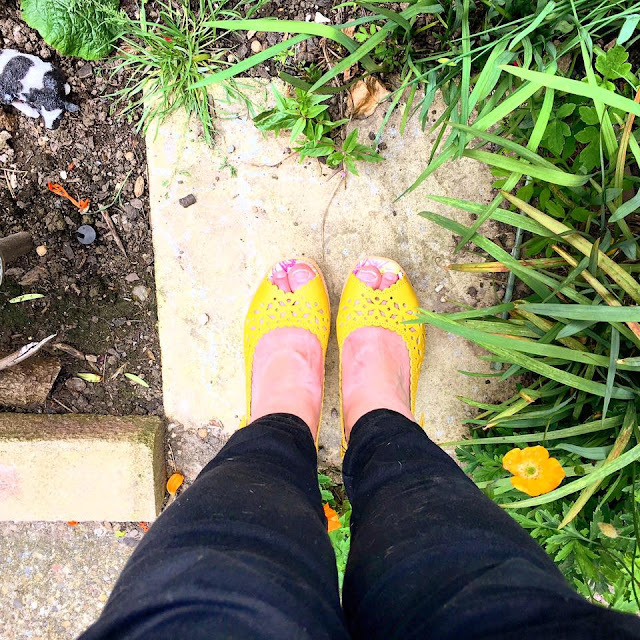 This style is called Faye Sunshine and at the moment they have 20% off until the end of Wimbledon on Sunday so it means these particular shoes are only £39.99 instead of £49.99! Also I'll just quietly mention this, if you go to their website, check out the women's floral boots and the saffron ones, I can see an autumn shoe wardrobe plan formulating in my mind! 2. Blogging, I have a whole new love for blogging in the last six months, it's mainly because of all of the ground work I've been doing, it's just been plugging away for hours sometimes but it's amazing when you hit your 30,000 visitors a month target you set yourself more than a year ago, I'm not sure what my next target it is but I would love one day to get 50,000 readers a month one day. I also love the friends the blogging community has brought me, we have the most fabulous bloggers network in the North East (thank you Sam for setting it up and your general support and encouragement). It's the most fun job I've ever had and I can't see a time now when I wouldn't blog, I think after 10 years it's kind of become a habit! 3. Summer Holidays, school is teasingly close to reaching the end of term and I cannot wait, I have adventures planned to Stratford Upon Avon with Abigail and Perth with Looby and we still have to book a week away together somewhere right at the end of August, I'm sure I'll squeeze in some other adventures as well and school holidays for me are about as close to the digital nomad lifestyle as I can get right now. I love no schedules, I love being able to work from the beach or a cafe or at lunch in a museum, I love the fact that I can always be present thanks to technology. That's the top 3 items on my own personal love list today, you know they change every day, every week, sometimes from moment to moment but it's such a great feeling to know you're in a happy place, if I had known such happiness lay in being single, well who knows what could have happened, I know though that my life now is about my children, my dog and I, it's about the friends I hold deep in my heart and it's about the communities of amazing business women that I try to give back to each and every day for success is only success when it is shared by and embraced by many. Disclaimer, I was sent the shoes in exchange for an honest review, the words are mine and the happy smiling face when I look down at my toes is definitely mine too!